He will see her soon. Nous verrons nos parents la semaine prochaine. We'll see our parents next week. Vous verrez la vie autrement. They will see their mistakes. Je t'enverrai une lettre de Monaco. I will send you a letter from Monaco. Tu enverras un cadeau à ta cousine ? Will you send a present to your cousin ? We will send you some pictures. Nous vous enverrons une facture. We'll send you an invoice. Enverrez-vous une carte à votre grand-mère ? Will you send a card to your grandmother? Mes enfants m'enverront une carte postale. My children will send me a postcard. Demain, j'y verrai plus clair. Tomorrow, I'll see things more clearly. Thanks, I've never come across that expression before. does “devoir” share the same irregularity and construction as “voir”? 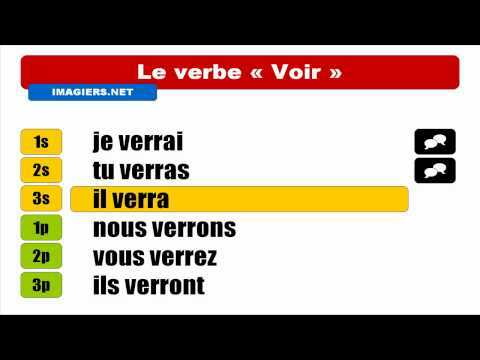 Did you know that you can use online tools to give you the forms of all French verbs? Where "on" refers to " we" as a specific group of people, should it not be "verrons" rather than "Verra"
On s'est rencontrés hier. -- We met yesterday. and will mean the same thing. D'accord, nous verrons ça plus tard ! Is it also correct to say: D'accord, on verra ça plus tard? Bonjour John, Yes, if it's an informal situation, on verra is fine.